My first impression on walking in – I like it. I like it firstly because it looks and feels so different to the other restaurants I’ve been to lately. It’s white and beige, it’s light and it’s spacious. Another thing I like – decent sized tables. One of my pet hates right now is having a table that’s too small and having to shuffle everything around when a dish comes and having plates almost hanging off the edge. Olea is part of the $10m development of heritage listed Electra House in King William Street, just a couple of doors up from the GPO. It’s been open 8 days and it serves modern Greek food with a twist. Interestingly, the executive chef, Alfonso Ales, who has worked in Michelin Star restaurants including El Bulli, is Spanish. We were greeted warmly and shown to our table. The paper doilies are a nice touch and the plates have been made by a local SA artist. The menu is solid and dishes are designed to share. Dishes are categorised into Meze, Wood charcoaled dishes, Larger dishes and Accompaniments. We started with the lamb cutlets and the pork sausages. The cutlets were meaty and juicy the sausages had great texture and were full of house-made flavour. To accompany this we had the haloumi salad with watermelon and cucumber and a bottle of Coriole Nero d’Avola from McLaren Vale. It’s a good wine list and priced really well. After this we opted for the 8 hour cooked lamb shoulder with tzatziki and the seafood selection plate. The lamb shoulder is a hearty dish and meaty enough to feed 2-3 people. The meat literally falls of the bone – it’s so succulent, and fantastic with the tzatziki. The seafood plate is of excellent quality. It consists of prawns, fish, squid and octopus. 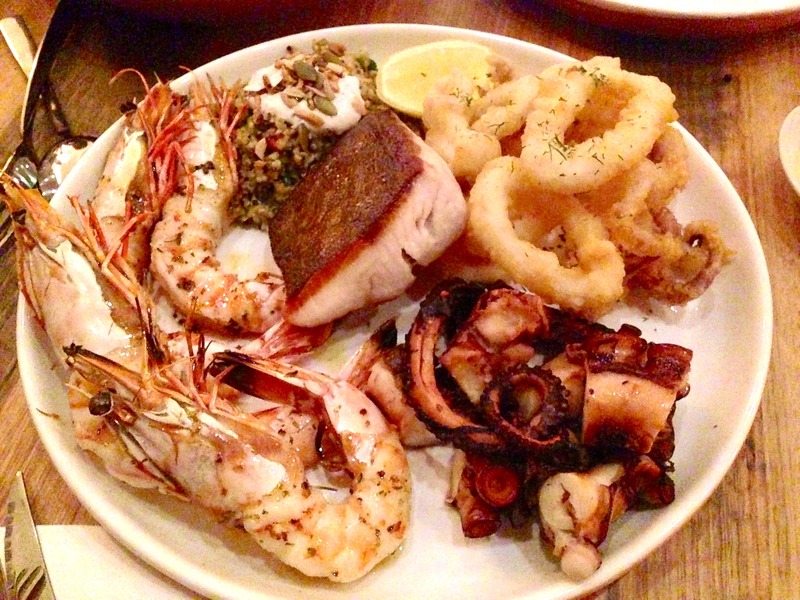 The prawns are large and beautifully fresh, the octopus is tender and the squid is some of the best I’ve had. The ancient grain was a nice change to the usual fries, and the dish was accompanied by a Village salad of cucumber, tomatoes, olives and fetta. To go with all of this, we had a bottle of Amato Vino Nebbiolo from the Margaret River. A very enjoyable drop. I’m not a dessert fan but the others ordered the Greek pastries and ipovrihio submarines which they enjoyed. I also took a photo of the Loukoumades that the table next to us ordered which looked pretty good. It’s simple food done well. The service was attentive and very friendly – our waitress was pretty excited about the place and working there which was nice. Olea is definitely worth a visit. And I also meant to say that I love your use of the word “beige”!